Jugular venous pulse is defined as the oscillating top of vertical column of blood in the right Internal Jugular Vein (IJV) that reflects the pressure changes in the right atrium in cardiac cycle. 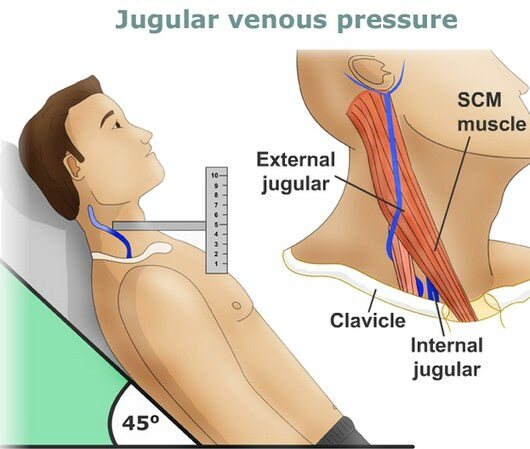 Jugular venous pressure (JVP) is the vertical height of oscillating column of blood. Why is Internal Jugular Vein (IJV) preferred? IJV is anatomicallty closer to and has a direct course to right atrium while EJV does not directly drain into Superior venacava. It is valveless and pulsations can be seen. Due to presence of valves in External Jugular vein, pulsations cannot be seen. Vasoconstriction secondary to hypotension (as in COngestive heart failure) can make EJV small and barely visible. EJV is superficial and prone to kinking. Why is Right Internal Jugular Vein (IJV) preferred? 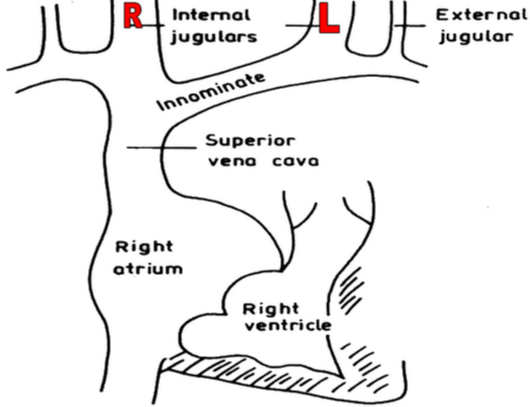 Right jugular veins extend in an almost straight line to superior venacava, thus favoring transmission of the hemodynamic changes from the right atrium. The left innominate vein is not in a straight line and may be kinked or compressed between Aortic Arch and sternum, by a dilated aorta, or by an aneurysm. 1) Position: Semi-reclining position with 45° angle between the trunk (not the neck) and the bed. Then, turn the head slightly towards left shoulder, so that the neck muscles are relaxed. Assure good lighting (can use tangential beam of light through torch). Look between the two heads of sternoclediomastoid. Note the upper level of pulsation, waveform and respiratory variation. Do not mistake the carotid pulsations for venous pulsations. No pulsations palpable. Palpable pulsations. Pulsations obliterated by pressure above the clavicle. Pulsations not obliterated by pressure above the clavicle. Level of pulse wave decreased on inspiration; increased on expiration. No effects of respiration on pulse. 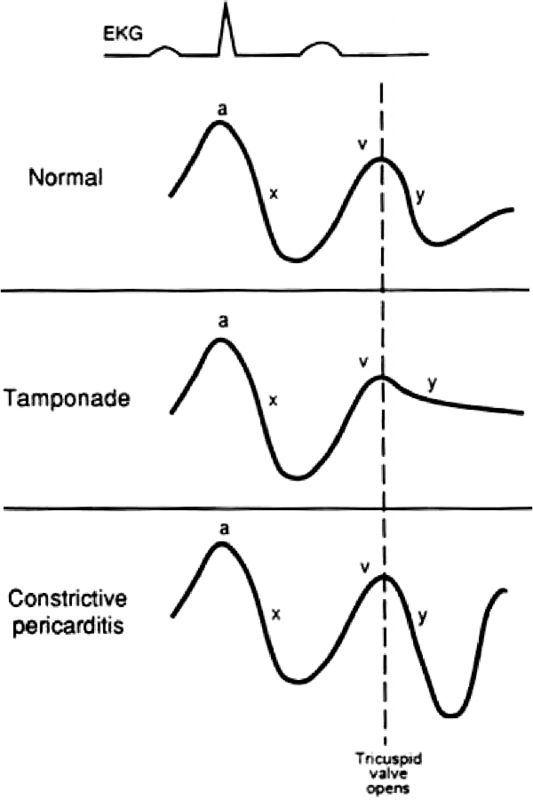 Usually two pulsations per systole (x and y descents). One pulsation per systole. Prominent descents. Descents not prominent. Pulsations sometimes more prominent with abdominal pressure. No effect of abdominal pressure on pulsations. It can be felt as a transverse prominence, about 5 cm below the suprasternal notch at the level of 2nd costal cartilage. Measure the vertical distance (in cm) between the horizontal lines drawn from the upper level of venous pulsation and the sternal angle. This can be done by using 2 rulers – one placed horizontal to the upper level of pulsation and another taking the vertical distance of that ruler from the sternal angle. Normally, the center of right atrium is 5 cm below the sternal angle. Hence, Add +5 cm to the above measurement to obtain the right atrial pressure. c wave: due to impact of the carotid artery adjacent to the jugular vein and retrograde transmission of a positive wave in the right atrium produced by the right ventricular systole and the bulging of the tricuspid valve into the right atrium. y wave (descent): due to opening of tricupsid valve and subsequent rapid inflow of blood from right atrium into the right ventricle leading to a sudden fall in right atrial pressure. 3) Venous hum: Continuous bruit over neck veins (normally noiseless) due to increased velocity of blood flow or decreased viscosity of blood. Pericardial pressure is distributed equally among all chambers since pericardial fluid is free flowing. This reduces the gradients between chambers throughout diastole. This is inconsequential in small effusions, but becomes hemodynamically significant in large effusions in which a greater pressure in the pericardium is transmitted to all four cardiac chambers resulting in “equalization of central pressures”. The reduction of the pressure gradient between the atria and the ventricles when the AV valves open mean that there is less transfer of blood from the atria to the ventricles. This is seen as a loss of the y-descent of the CVP or PCWP waveform tracings. 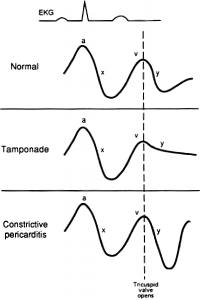 – In contrast, the thickened pericardium in constrictive pericarditis does not restrict chamber enlargement at low volumes and therefore does not impair early diastolic filling but at higher volumes the limiting constraint is reached and filling is limited and the pressures in all chambers will become equal. Filling is preserved in early diastole but compromised in late diastole. 2 Why is Internal Jugular Vein (IJV) preferred? 3 Why is Right Internal Jugular Vein (IJV) preferred? Should the image say sternal angle not sternal notch? Great observation. Thank you. The picture shall be corrected and changed. Very nicely explained.Excellent for medical students and fresh residents. Very well tackled… Very well explained to understand. Thanks. Well presented… Information is helpful during clinicals.. This article is really helpful and reliable.